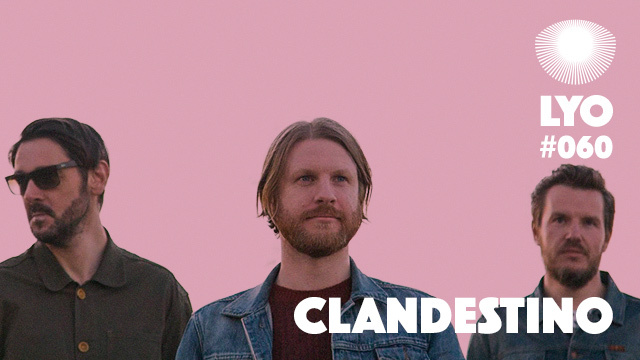 Clandestino is a dj/producer/promoter trio based in Leeds, UK, formed by Joe Morris, Nick Smith and Ian Mac. Inluenced by acid house, balearic and nu disco, they’ve been involved in the British underground music scene for over 15 years, setting parties in town with prestigious international artists on the bill such as Erol Alkan, Tim Sweeney, Simian Mobile Disco, Todd Terje or Optimo. Their own podcast series includes Andrew Weatherall, Eskimo, Khidja, Black Merlin or Ruf Dug amongst others. In 2015, the collective signed a track for Midnight Riot Recordings and a four tracker on Is It Balearic? Recordings, on which Joe Morris is also about to release « The Golden Tides EP » after a first record on El Diablo’s Social Club and a remix for Nang records, whereas Nick Smith has just released his first EP on Red Laser Records. This fine exclusive mix for LYO is a perfect exemple of Clandestino’s skills and influences. Enjoy!